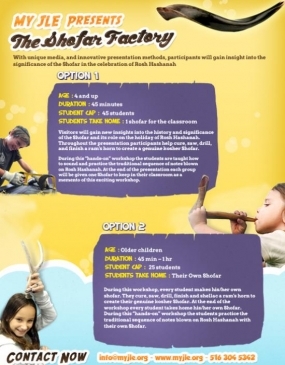 Visitors will gain new insights into the history and significance of the Shofar and its role on the holiday of Rosh Hashanah. Throughout the presentation participants help cure, saw, drill, and finish a ram's horn to create a genuine kosher Shofar. During this “hands-on” workshop the students are taught how to sound and practice the traditional sequence of notes blown on Rosh Hashanah. At the end of the presentation each group will be given one Shofar to keep in their classroom as a memento of this exciting workshop. 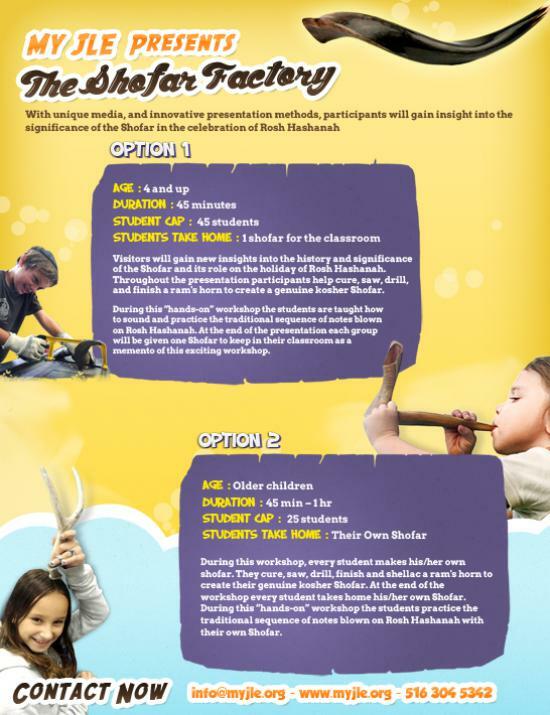 During this workshop, every student makes his/her own shofar. They cure, saw, drill, finish and shellac a ram's horn to create their genuine kosher Shofar. At the end of the workshop every student takes home his/her own Shofar. During this “hands-on” workshop the students practice the traditional sequence of notes blown on Rosh Hashanah with their own Shofar.